This modern 3-star hotel sits in Arlington, close to the Pentagon, with the nearby metro providing great transport links around the city. Dive into the stylish pool, work out in the fitness centre, enjoy classic and contemporary flavours in the two restaurants or just relax in the bar. The hotel’s air conditioned rooms have flat-screen TVs, coffee makers and wifi access. Expect stunning US capital views from the DoubleTree by Hilton Hotel Washington DC-Crystal City. Located in the Crystal City neighborhood, our hotel in Arlington, Virginia offers a skyline panorama that includes the Washington Monument and the Potomac River.Discover different perspectives from the Skydome Lounge, Windows Over Washington restaurant, the fitness center, and guest and meeting rooms at our hotel in Arlington, VA. Indulge in the signature DoubleTree cookie, our welcoming gift to you. Linger over a cocktail from the Skydome or the sky-lit lobby bar. Pair a fine wine with American cuisine at Windows Over Washington or choose between Café Go and the Café Restaurant.Work out using our well-equipped fitness center and heated indoor pool. Request a PURE® allergy friendly room or suite. Enjoy movies and games with a late snack from in-room dining.Take advantage of free internet in the lobby and kiosks. Internet access in guest accommodations and meeting rooms is available for a nominal fee. Plan a meeting or event using our Arlington, VA hotel’s 31,000 sq. ft. of flexible meeting space, featuring balconies and offering room for 1,000 guests.Enjoy a stroll to the Pentagon or Crystal Drive Office Park for a business meeting or go to the Crystal Underground Shopping Center to find a souvenir. Take a ride on the complimentary hotel shuttle to Pentagon City Metro light rail station for a day of sightseeing or to Ronald Reagan National Airport for your flight home. Welcome to the Finest of Arlington, Virginia Hotels Situated near Washington, D.C., the full-service Holiday Inn® National Airport/Crystal City offers superior comfort for both leisure and business travelers. We're conveniently located near Ronald Reagan Washington National Airport (DCA). Our Crystal City hotel is within minutes of the nation's capital and attractions. Many guests enjoy touring the Pentagon, Smithsonian Institute, and monuments throughout Washington, D.C. while Crystal City is a favorite shopping destination for our hotel's guests. Old Town Alexandria is the perfect place for viewing the Potomac River and is just one of many historic districts around Arlington, Virginia. The Holiday Inn® National Airport/Crystal City is also convenient to many northern Virginia companies including IBM, Boeing, Lockheed Martin, EPA, Raytheon, USPTO, and Navy Elite and we feature a 24-hour business center and flexible meeting facilities. Government contract and military travelers are always welcome. Our extensive amenities and friendly staff are notable among hotels near Washington, D.C. Guests can surf the free high-speed, wired and wireless internet access throughout the hotel, visit the gift shop, work out in our fitness center and enjoy a meal at O'Malley's Sports Pub or Fresh Kitchen! Travelers in search of a great deal should look no further than this Crystal City hotel. Welcome to our Nation's Capital! Conveniently located at 1480 Crystal Drive, the Crowne Plaza Washington National Airport is just one mile from Ronald Reagan Washington National Airport. Take advantage of our complimentary shuttle from the airport to the hotel and our location, which is just four miles from the National Mall. Our location puts you in the perfect position to see everything the city has to offer. Visit the Lincoln Memorial, the Thomas Jefferson Memorial, the Vietnam Veterans Memorial, the Martin Luther King Jr. Memorial, or one of the Smithsonian Institution Museums, including the National Museum of African American History and Culture. If sports is more of what you are looking for, catch a Washington Nationals game at Nationals Park or Wizards game Capital One Arena, home of the World Champions Washington Capitals. Our 5,800 square feet of indoor event space, including our luxurious and spacious Grand Ballroom, is available for your unique gathering. For a package deal that takes care of your business needs, you can contact our Meetings Director here at the Crowne Plaza Washington National Airport. 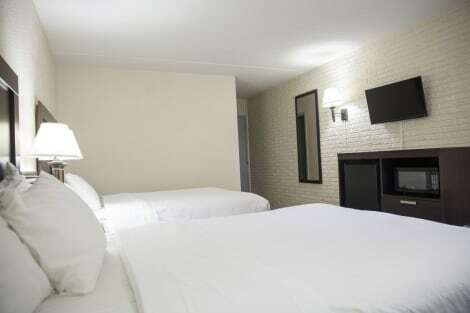 All of our guest rooms have complimentary WiFi, flat screen TVs, satellite or cable channels, and ergonomic work desks. Take advantage of our well-equipped fitness center or dine in one of our two onsite restaurants. We look forward to welcoming you to the Crowne Plaza during your next stay! 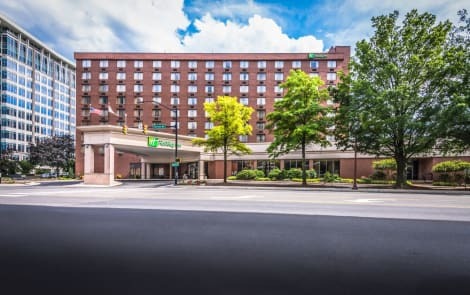 We Go Beyond Other Hotels in the Washington, DC Area The Holiday Inn® Arlington at Ballston hotel is located in the vibrant urban neighborhood of Ballston, near all of the popular DC area attractions, and only three blocks from the Metro. During your stay, enjoy our 100% non-smoking hotel with comfortable rooms, with 32-inch TVs, Kuerig coffee makers, and refrigerator. You'll love our amenities including free high-speed Internet access, area shuttle, 5,000 square feet of meeting space, 24 hour Fitness Center, seasonal outdoor pool and Silver Leaf Restaurant where kids eat free. We’re perfectly located just off of I-66, blocks from many companies and government agencies including Accenture, ESI, Willis Towers Watson, SAIC, the Nature Conservancy, AES, Marymount, and DARPA. Hop on our Free Area Shuttle (one-mile radius) to experience the best of Ballston, including the Metro, dining, shopping, Ballston Quarter and the Kettler Capitals IcePlex. Washington, DC is just across the river and it’s easy to explore DC monuments and museums, including the Smithsonian, White House, Air & Space Museum, and the National Mall. Be sure to visit Arlington National Cemetery, The Air Force Memorial, The Marine Corps Memorial and the Pentagon Memorial, both located in Arlington, Virginia. Make yourself at home in one of the 76 air-conditioned rooms featuring refrigerators and microwaves. Complimentary wired and wireless Internet access keeps you connected, and cable programming provides entertainment. Private bathrooms with shower/tub combinations feature complimentary toiletries and hair dryers. Conveniences include desks and complimentary newspapers, as well as phones with free local calls. The Hilton Garden Inn Reagan National Airport is close to all the excitement of Washington DC. Hilton Garden Inn Reagan National Airport is just a half of mile from Reagan National Airport and just minutes from downtown Washington DC. We are just minutes' walking distance to the metro to attractions or ride our complimentary hotel shuttle to and from the airport.Start your day with a choice of delicious breakfast options at our on-site restaurant or grab something to go from our 24-hour Suite Shop. Get in a workout at the fitness center and enjoy the crisp morning air on our sun deck.Explore the local area with plenty of dining and shopping options as well as museums and historical monuments.Host a grand event in our space for up to 300 people in theater-style seating or take advantage of the divisible space for four different rooms. The event space is ideal for small to medium meetings. Arlington Hotel's Key Bridge Locale Grants Access to DCOverlooking Washington, DC and adjacent to historic Georgetown, the Holiday Inn® Rosslyn at Key Bridge hotel offers comfort, convenience and a genuine value to real people in the greater DC area. 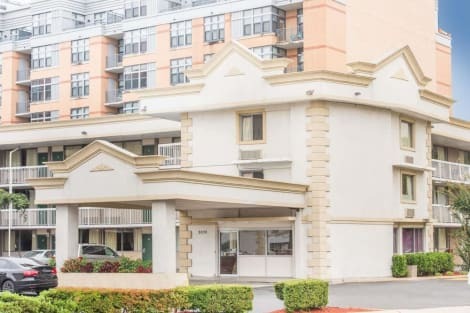 The ideal proximity to the Metrorail makes this the premier lodging for corporate travelers and vacationers alike in Arlington, VA.The hotel's location one block away from the Metro of DC is especially convenient for business travelers who expect an efficient and productive stay. Quick access to major corporations like Boeing, Northrop Grumman and ESI with ease, or pay a visit to major government departments at the Pentagon or on Capitol Hill. Guests can also arrange to use of one of the hotel's 12 state-of-the-art meeting rooms to host business events on site.Leisure travelers are equally well-situated with this hotel's location near Washington, DC. Cross the Key Bridge into Georgetown for an afternoon of premium shopping and dining. The National Mall is just a few stop’s away on the Metro, and is a great staging point for touring DC.Among hotels near Washington, DC, this is the property where you can truly stay your way. Surf the Web with fast and free Wi-Fi access. Go for a swim in the heated, indoor pool. Call to reserve today, and "Stay Real" in the DC area! When you stay at Inns Of Virginia - Arlington in Arlington, you'll be near the airport, within a 10-minute drive of Kennedy Center and Lincoln Memorial. 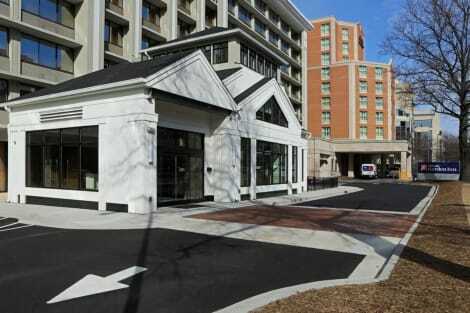 This hotel is 4 mi (6.5 km) from Arlington National Cemetery and 4.4 mi (7 km) from George Washington University. 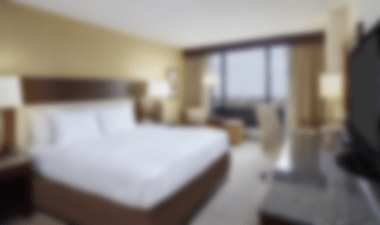 Walk to the Pentagon and access historic attractions, shopping, and dining easily from the Embassy Suites Crystal City-National Airport hotel in Arlington, Virginia. Ride the nearby Metro subway system to the National Mall area to visit Smithsonian museums, the White House, the U.S. Capitol, and several national monuments. Tour quaint Old Town Alexandria, VA or visit Arlington National Cemetery. 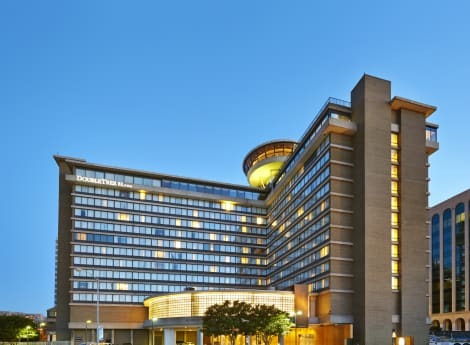 This all-suite Arlington, VA hotel is also within walking distance of The Fashion Centre at Pentagon City and Crystal City Shops.Enjoy a complimentary cooked-to-order breakfast in our tropical atrium. Relax after a long day at our complimentary Evening Reception*, which includes a variety of beverages and snacks. Maintain your exercise routine at our complimentary 24-hour fitness center or take a dip in our refreshing indoor pool and spa.Unwind in your one- or two-bedroom suite complete with a separate living room, wet bar, and high-speed internet access. Enjoy a snack and e-mail colleagues from your well-lit dining and work table. Accessible and smoking rooms are also available at our Arlington, VA hotel in Crystal City.Plan your business meeting or event at the Embassy Suites Crystal City-National Airport. Utilize 5,000 sq. ft. of meeting space and the services of our friendly catering staff. In addition to our 24-hour BusinessLink™ Business Center, take advantage of A/V equipment rental and high-tech amenities. *Service of alcohol subject to state and local laws. Must be of legal drinking age. Make yourself at home in one of the 141 air-conditioned rooms featuring refrigerators and microwaves. Flat-screen televisions with cable programming provide entertainment, while complimentary wireless Internet access keeps you connected. Private bathrooms with showers feature complimentary toiletries and hair dryers. Conveniences include desks and coffee/tea makers, as well as phones with free local calls.